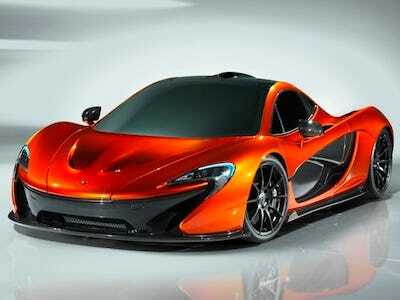 One of the most sought-after pieces of information concerning the upcoming McLaren P1 supercar has been revealed today. We can confirm that the P1 will deliver a peak output of 903 horsepower and 663 pound-feet of torque from a newly-developed hybrid drivetrain consisting of an advanced hybrid system matched to a V-8 engine. The V-8 engine is an upgraded version of the twin-turbocharged 3.8-liter M838T unit built by Ricardo and currently fitted to the MP4-12C, though in its latest application it gets coupled to a low-weight, highly efficient electric motor that ensures instant torque for optimised throttle response. Some of the upgrades to the P1’s engine include optimised cooling and durability under the higher loads; the V-8 by itself is rated at 727 horsepower and 530 pound-feet of torque, which is 111 horsepower and 88 pound-feet of torque more than the figures for the 12C’s engine, respectively. The electric motor adds 176 horsepower and 191 pound-feet of torque, though the peak torque of the motor and engine arrive at different points. The lower peak torque of the electric motor is said to help the force-fed V-8 feel more like a naturally aspirated engine. The amount of power delivered under IPAS will depend on how much charge remains in the onboard lithium-ion battery, which is sandwiched between the engine and seats, and adds about 210 pounds to the weight of the car. When the battery is empty, the V-8 will automatically start to maintain drive and charge the battery, although the battery can also be topped up under braking or by using an ordinary household plug. The P1, then, is essentially a plug-in hybrid. The electric motor is mounted directly onto the engine, and all drive is channeled through the same dual-clutch seven-speed gearbox found in the 12C and out to the rear wheels. Note, a further benefit is that the electric motor also allows faster upshifts of the gearbox. This is achieved through the application of instant negative torque at the point of shift, making the engine revs drop as quickly and efficiently as possible to the required engine speed for the upshift.You’ll notice that the P1’s steering wheel features a second button marked “DRS.” This is to activate the car’s Drag Reduction System, which uses technology similar to that employed on current Formula One cars. Speed can be increased by reducing the amount of drag–up to 23 per cent–on the the P1’s rear wing, which is done by changing its angle. The system immediately deactivates when the button is released, or if the driver touches the brake pedal. Also found in the P1’s relatively spartan cabin is a digital gauge cluster, which adopts a race-inspired digital dash readout. The display has multiple modes including a “Race” mode, where a bank of lights across the top illuminate green, followed by red and finally blue. These act as a shift indicator, as in McLaren’s own Formula One race cars. As we already know, the car’s construction is all carbon fibre. Built around what McLaren likes to call the MonoCage, the P1 uses a carbon fibre monocoque and roof structure to form a strong safety cage. The structure of the MonoCage, unlike the 12C’s MonoCell, also serves to guide air into the engine through an integral roof snorkel and air intake ducts, saving further weight. Look for further information on the P1 to be released in the coming weeks, ahead of the car’s official world debut at the 2013 Geneva Motor Show on March 5. We’ll bring you live pictures and details from the reveal as part of our complete Geneva show coverage.